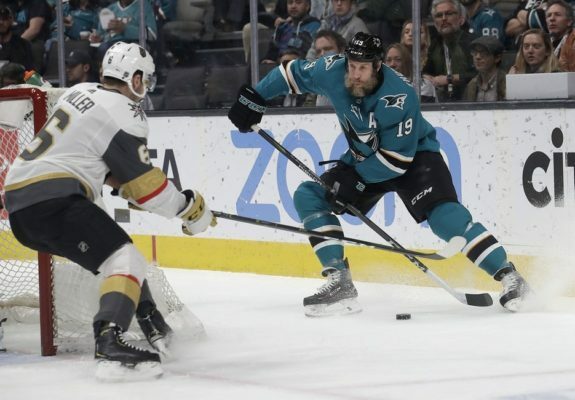 SAN JOSE, Calif. — Reilly Smith and Jonathan Marchessault each had four points and the Vegas Golden Knights won for the ninth time in 10 games, beating the San Jose Sharks 7-3 on Monday night. The intensity was high from the start, with Couture’s goal on the opening shift setting the tone for a wild first period that featured five goals, 25 shots, five power plays and a goalie change. Marchessault and Smith were involved in all three goals, capped by Marchessault’s bad-angle shot that ended Jones’ night. The Golden Knights could have had even more when they got a power play late in the period after Micheal Haley took exception to Ryan Reaves’ hard hit on Melker Karlsson before a line change. Haley rushed over and tried to pull Reaves off the bench for a fight, getting a penalty on the play. Vegas couldn’t capitalize despite getting 16 seconds of a two-man advantage for too many men on the ice. But the Golden Knights did take advantage of a bad penalty in the second period when Thornton hit Shea Theodore late in the offensive zone for an interference call. That led to Stastny’s goal that put Vegas up 4-2 heading into the third. Smith’s goal in the opening minute of the period put Vegas in control. NOTES: Only two Vegas players had previously recorded four points in a game: Karlsson and Theodore did it last season. … Couture’s first goal gave him 500 career points. … Sharks captain Joe Pavelski missed his first game with an injury since Jan. 11, 2011, after taking a hard hit Saturday against Nashville. The only other game he had missed since then was for rest in the final game of the 2016-17 season.